Bolečine v križu: vzrok ali posledica? – Have a hip mobility issue? – Have a thoracic spine mobility issue? Many of the unstable lumbar spines we see are due to poor/inefficient movement patterns. You’ll see a lot of this in women who perform a lot of Yoga and Pilates. I’m not going to throw these practices under the bus altogether, but quite often these practitioners don’t focus on quality of movement as much as they do quantity of movement. If you want to engage in these practices, make sure you find a good instructor who understands their biomechanics. When you’re evaluating someone with low back pain, be very cognizant of not only how they move, but where they get that movement from. 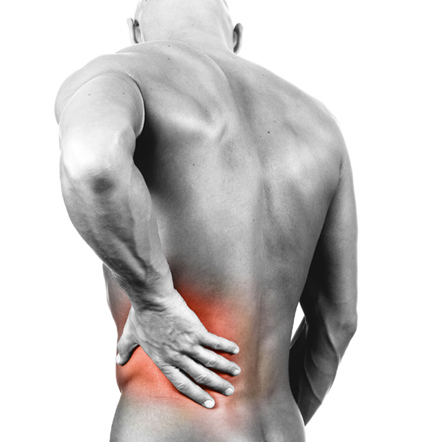 Chances are the low back pain isn’t so much a cause as it is a symptom. Izkaže se torej, da so bolečine v križu lahko posledica pomanjkljive gibljivosti in biomehanike (zlasti v predelu bokov in prsnega [torakalnega] dela hrbtenice). Poleg izboljšanja tehnike izvedbe posamičnega giba je potemtakem zalo pomembno tudi pridobiti ali izboljšati ustrezno gibljivost in mobilnost problematičnih delov (vendar ne na rovaš stabilnosti drugih struktur, o čemer je bilo govora tukaj). Govorili pa smo tudi že o tem, da “telo ni le seštevek ločenih segmentov, temveč je ubrana celota”, zaradi česar lahko “npr. nepravilnosti v gibljivosti/stabilnosti gležnja povzročajo težave v kolenu, kolkih ali spodnjem hrbtu itd.” Poleg predelov, ki so najbolj problematični, bi bilo torej dobro proučiti še druge predele, ki pogosto igrajo pomembno vlogo pri nastanku določenega problema. Spodaj prilagam nekaj videov z osnovnimi vajami za izboljšanje mobilnosti torakalne hrbtenice, ramen in gležnjev ter kolkov. – foam roller pec minor stretch. – ankle capsule mobilization with a belt. And for crying out loud. Don’t go into the pain cave. I can’t stress this enough. Your Totem Animal won’t be in there to help you. You’ll be on your own. The Pain Cave is for cowards. Pain is your companion, don’t go hide from it. It’s ok to do a mobility wod every day. Homework: Make someone in your office of family do it too. Častim pivo/čaj tistemu, ki ve, kaj ima Starrett v mislih, ko govori o “jami bolečine” in “totemskih živalih” (namig: Brad Pitt). Dragi bralci, preljube bralke, upam, da vam bodo priloženi videi pomagali na vaši vadbeni poti in da bo komu med vami uspelo razrešiti uganko ter si tako prislužiti zastonj pivo/čaj. Bulging, Herniation, and Spinal issues: Bulging and herniated discs will manifest pain on or in the spine itself. If you can sense the pain in the direct center of the back, it will be one of these problems. Additionally, if the bulging or herniation is low enough on the spine it may also impinging on some of the nerve roots coming out to the sides. This tends to manifest itself as radiating pain out of the side or lower extremities. These are called radiculopathies (from the “nerve roots” and and the “radiating pain” caused by the impingement/pinching of these nerve roots). Sacroiliac joint issues: During improper lifting or bending one side of the muscles may fail a bit earlier than the other. This is common as we all have a dominant side. In this instance if the muscles do not strain or the weight is not immediately deloaded, the SI joint may slip or become rotated causing pain. (…) Thus, if your pain is (1) 1-2 inches off center from the spine, (2) is an 1-2 inches lower than the iliac crest level, and (3) feels in the bony region of the pelvis it may be likely have you have an SI joint issue. Same with the functional leg length. Strains: Strained and pulled muscles will be located to either side of the spine in the muscle belly of the tissues. Strains will usually occur during lifting and in the spinal erectors – iliocostalis, longissimus, and spinalis – although they can occur in muscles such as the quadratus lumborum or others. Red — this area is all muscle and connective tissue and thus the things that tend to give first during exercises is muscles. Thus, this region indicates for the most part strains. Yellow — obviously this is on the spine which indicates if there’s pain in or extremely close to the spine that either there’s a problem with the discs or the nerve roots coming out. 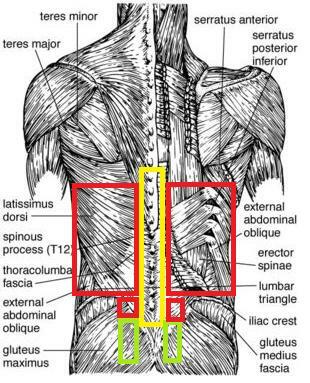 Green — The SI joints are located here, about an inch or two below the iliac crest (which is at L4-L5) a couple inches on either side of the spine. This or spinal problems can and may refer shooting pain down the leg.